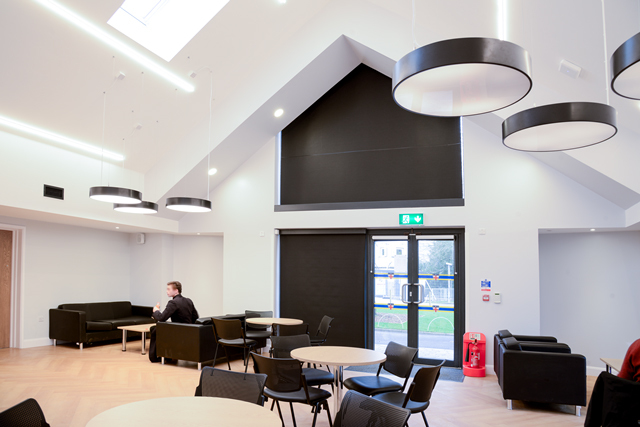 Waverley have recently completed installation of blinds to newly built halls at the renowned Christ’s Hospital School in Horsham, West Sussex. Working for main contractors Sunninghill Construction, Waverley manufactured and installed electric roller blinds including blinds to suit high-level triangular shaped gable end windows. The halls were designed to be a modern venue with a light and open ambience. The pitched roof ceiling with a series of roof light windows floods the area with natural daylight. In addition, both gables benefit from fully glazed doors with glass panels above which distribute natural daylight at high level creating a stimulating environment to teach and learn. School buildings are increasingly being designed to maximise the use of natural daylight to improve energy efficiency as well as the health and well-being of students and teachers. As a result, high-level glazing is becoming more common which creates challenges in cases where the ability to provide shading and room darkening is required. Waverley’s product range and expertise include several solutions for these scenarios. Waverley installed ShadeTech® RBT-W electric tensioned roller blinds to the gable end glazing. The roller tube with fabric is mounted horizontally at the base of the glazing and concealed behind an aluminium fascia powder coated to match the door and window frames. The fabric is cut to suit the shape of the gable end and is pulled up in front of the glass by a series of tensioned pull cords attached to the leading edge of the fabric. DeltaBlock® 70 fabric provides an excellent degree of room darkening when activities in the hall require it. The fabric benefits from a white backing which reflects heat away from the interior keeping the temperature inside cool in hot weather. ShadeTech RBL-E electric roller blinds are installed to the lower level windows and all electric blinds are operated effortlessly via a wall mounted remote switch. All electric blinds are concealed inside an aluminium cassette which is powder coated black to match the window frames. This allows the blinds to blend in with the window frames when not in use. The use of dim-out roller blinds enables teachers to transform the space from a room filled with natural light to a dark room suitable for audio-visual presentations at the touch of a button. If you would like help with a similar project then please contact us.